While biometrics and fingerprint identification has been existing for well over 100 years in some basic form, it is the growth of maker community that made modules like R305 and SM630 so popular. R305 and S630 are common modules used for fingerprint scanners, with the aid of a powerful DSP in its core. Basically both of these modules work the same way, we can communicate with them using a packet of hex codes in a specific format. However, the commands for operation can vary from module to module, for which we should have its datasheet. Well, for now we have the R305 here, just tested it with the products demo software from SFG. Though these have no good English documentation, SFG has done a real good work with the demo software (except the bad UI ). So.. thats it! Lets get started. The first 4 pins are for serial communication with default baudrate of 57600. User may set the baud rate in 9600 -115200 bps. Pins 5 – 8 are for USB communication. 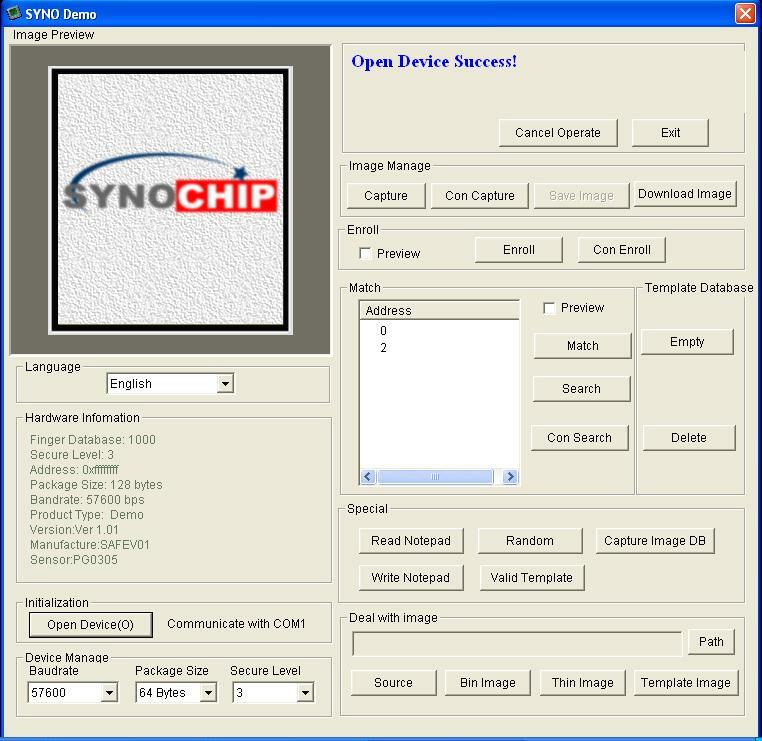 Connect the fingerprint reader to the computer via USB-serial converter. The connection diagram shown here uses the breakout board for the FTDI FT232RL USB to serial IC. Another good option is the CP2102 basic board for the USB to serial conversion. You can find variety of converters here. If you use USB data from reader, you need not use this converter. Once all the necessary connections are made, connect the setup to PC using USB miniB Cable. The cable is used both for powering the system and for communication between the system and PC. When powered on, it usually takes about 500ms for initialization. During this period, the module can’t accept commands. The red LED on the scanner pad blinks during this time, this indicates that the sensor is working. Each module has an identifying address. When communicating another system, each instruction/data is transferred in data package form, which contains the device address. Module responds only to data package whose address value is the same with its identifying address. The address length is 4 bytes, and its default factory value is 0xFFFFFFFF. User may modify the address via instruction. The new modified address remains at power off. 2. 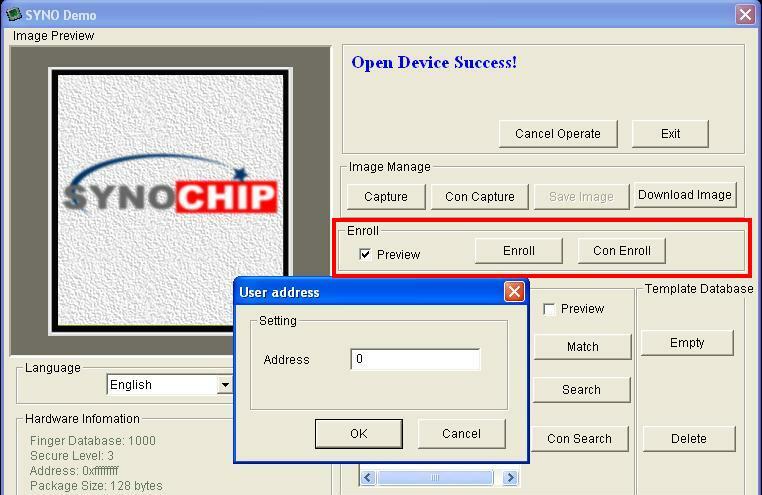 Click Open Device (in the bottom left corner). A new window opens up. Select the COM port used by the USB – serial converter (You can get the COM port from the device manager) and press OK when done. On the other hand, if there is any connection error or if the default address/password has been modified, you will get an error message. 3. Now its time to enroll a new finger! Click the Preview checkbox and press the Enroll button next to it (See the red box). Con Enroll means Continuous enroll which you can use if you have many fingers to enroll. When the box comes up enter the ID you want to use. You can use up to 162 ID numbers . 4. 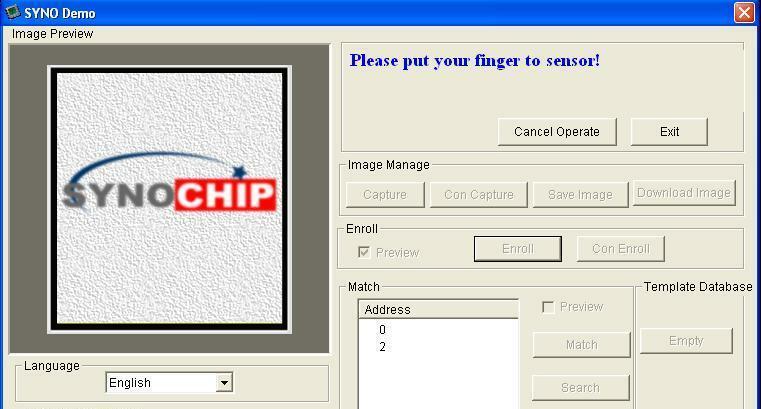 Once the ID is given, the software will ask you to press the finger to the sensor. Now the LED blinks rapidly. You can place your finger on the window. You will have to place the finger once again to get a second clean print. Use the same finger. If there’s a problem such as a bad print or image you’ll get an error message and have to do it again. Note : The ‘enroll’ example in the Github repository worked properly only when line no: 64 was commented. 37 Responses to "Getting Started with Optical Fingerprint Reader – R305"
Please give us more details regarding the issue that you are facing. Hi, I have problems with using this fingerprint reader. First, I’ve soldered the USB connections as the documentation says, connected to a laptop and nothing happened. The red led stays dark, the computer cannot see any device. Second I soldered the serial connector to a FTDI usb to serial board. When I connect it to the computer the red led blinks on the reader and I can connect to it with the demo program. 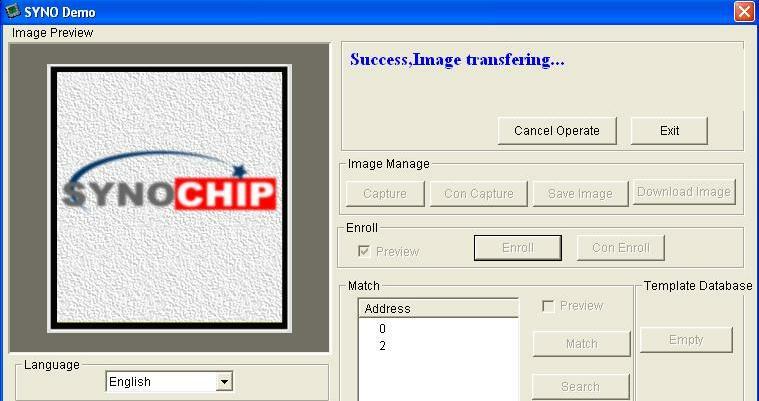 When I click on Capture or Enroll then after the “Image transfering…” message always get a “Create specified file error”. The day we received your comment we did start some research on the topic, but unfortunately it seems like no proper driver is available for R305. We even tried contacting the OEM for any available resources but that ended up like a wild goose chase. We are still looking out and we will post it over here if we could come up with anything helpful. While testing, we have passed the above mentioned hex values to start communication. 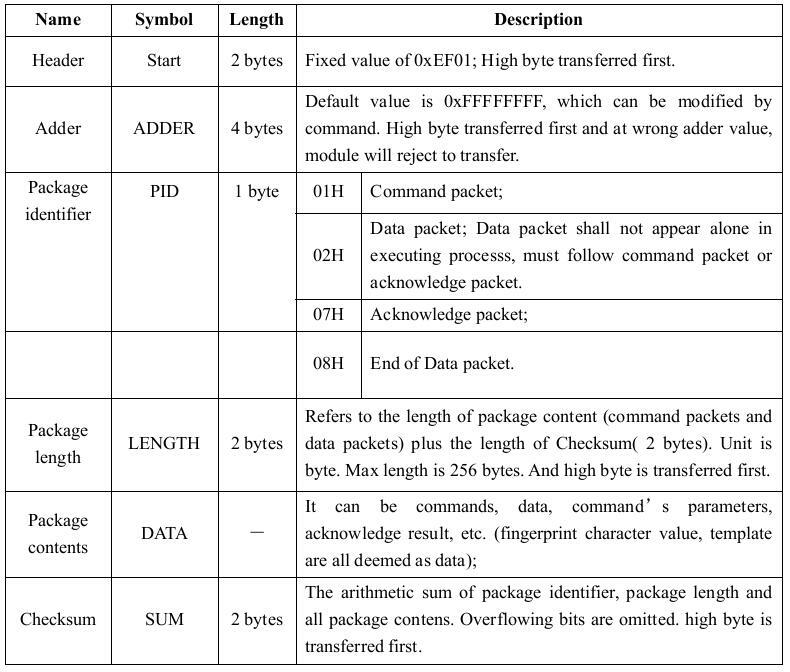 Please refer datasheet for packet structure. Hopefully after passing the above hex bytes, your module should start responding to your commands. Sir, how to provide password…. The password length is 4 bytes, and its default factory value is 0FFH, 0FFH, 0FFH, 0FFH. If you want to modify password, refer to instruction SetPwd, then Module (or device) handshaking password must be verified before the system enter into normal operation mode. Or else, system will refuse to execute and command. The new modified password is stored in Flash and remains at power off. Could you please provide me a clarification on the size of 1 Finger print library location, as it is no where mentioned in datasheet , I mean whether it is 256 bytes or 512 bytes. 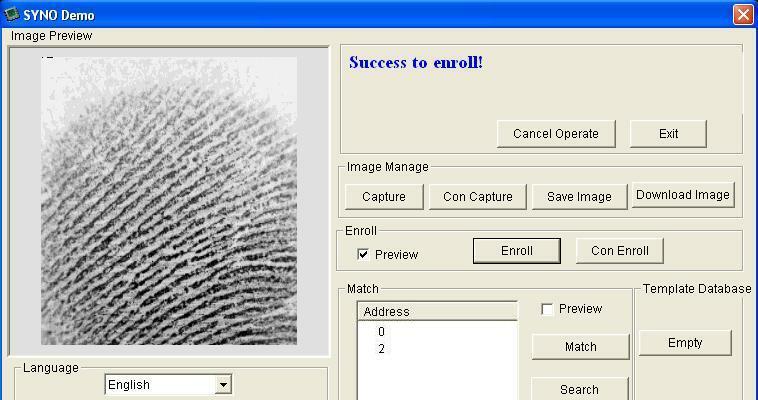 The size of 1 Finger print library location is 512 bytes. It can be confirmed by using the Read System Parameter (ReadSysPara) command. 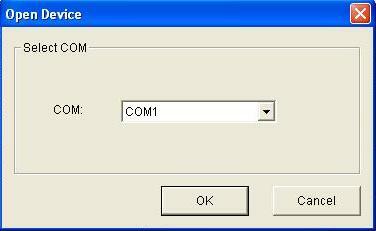 By using this command we can read module’s status register and system basic configuration parameter. How to provide the valid password..? You need a valid password to start communicating with the product. By default password is 0×00 0×00 0×00 0×00 0×00. For setting password you can use the SetPwd(Set Password) instruction. While testing, we have passed the above mentioned hex values to Set Password. Mine working fine.Thank you very much. I used arduino uno as serial converter. R305 fingerprint reader is showing the following error.”open device fail, please check the password and the device address”. Kindly help. If there is any connection error or default address/password has been modified,it will pop up this error. Please go through the rhydoLABZ wiki page for R305 finger print reader. I am using arduino to store fingerprints….I am using Adafruit fingerprint sensor library…When I upload a enroll sketch, only one fingerprint is getting stored…Everytime I store a fingerprint the latest one is only getting stored…Please help me. It is quite easy to use the fingerprint reader with Arduino by using this library from Github. It uses software serial pins to communicate with the reader. Kindly download the library from following link. We have to put Line no. 64 in comments for “enroll programme”?? Or normal programming language?? The ‘enroll’ example in the Github repository worked properly only when line no: 64 was commented. 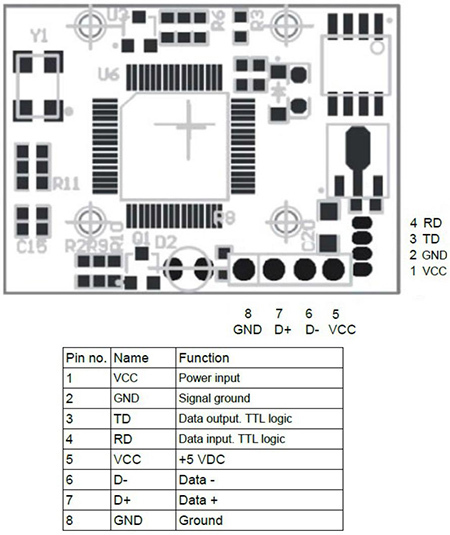 hi i am making a project i am using the r305 with arduino mega when i run the program in it it displays “did not find finger print sensor”" and the lights in the sensor also dont get on. i ahave connected the tx pin of sensor to arduino and rx to tx of arduino and the gnd , vcc. and in the enroll example program “SoftwareSerial mySerial(2, 3);” the pins are 2 and 3 what should i change in this line. 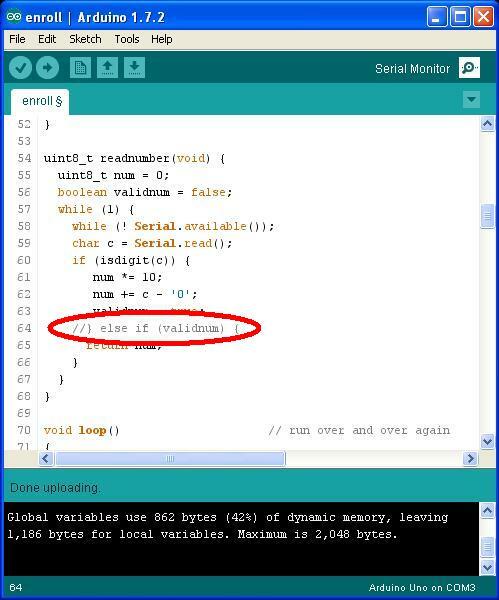 There is some limitation for software serial in Arduino Mega. Not all pins on the Mega and Mega 2560 support change interrupts, so only the following can be used for RX: 10, 11, 12, 13, 14, 15, 50, 51, 52, 53, A8 (62), A9 (63), A10 (64), A11 (65), A12 (66), A13 (67), A14 (68), A15 (69). i`m using R305 finger print scanner can you help me how can i erase flash and set the default address FF FF FF FF. i have change the address now i can’t able to capture the image. I have r305 fingerprint module and connected with arm board but sensor is still dark. Pls help me solve this problem . How can started this module properly. Could you please check the LED will blink inside the module when you power up? And also check the power to the module is 5v or not. i.e input ‘q’ then the number is 69 or 200 or198 then the same fingerprint can still be stored in a different id number. please help! thanks! Which header are you using? In R305, for each process we are sending a hex command and we get a response from the fingerprint module. Just go through the datasheet of R305 to know how the fingerprint works and you can edit the program if there is any error. If there is any connection error or default address/password has been modified,it will pop up this error. For setting address you can use the SetAdder(Set Module address) instruction. Does this module work with rpi3? 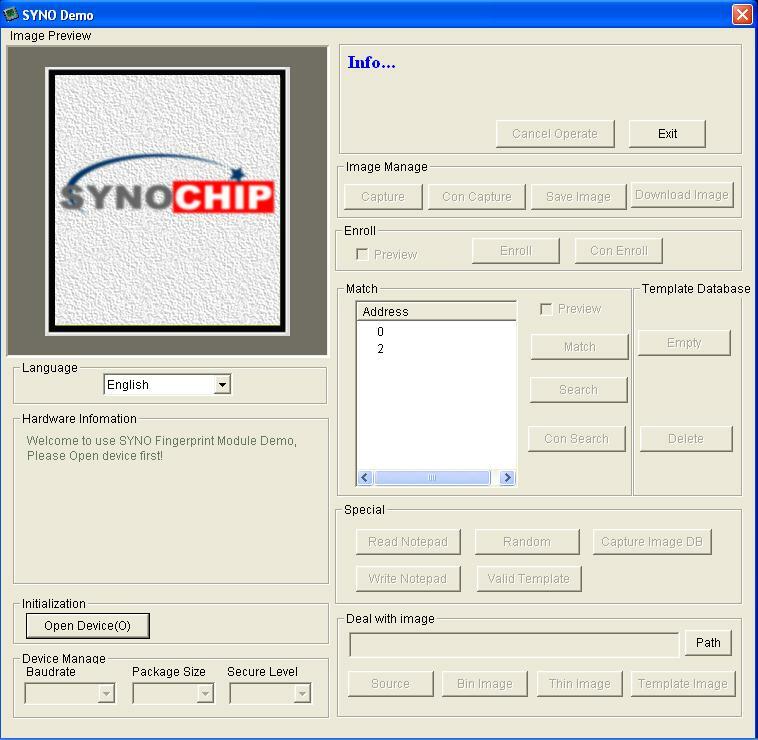 We can download the template from the module using DownChar command . Please go through the link given below. Is there a compatible python module available to interface with this module?